Throughout the centuries there have been many coins that were either officially or unofficially called a "Crown." The term crown is even used as a size adjective, as in crown-sized coins. Thus, coins like the 5 Sols of Peru or the Gourde of Haiti are often referred to as crowns. Even the Silver Dollar of the United States of America has been referred to in this manner. Then, there are many coins which have the name crown such as the Korun of Hungary, the Coronat of Poland, or the Couronne d'Or (Crown of Gold) struck in the Brabant by Spain from the mid 1500s to the early 1700s. This site deals with the Crown coins issued by Britain and by her Colonies, Territories, Protectorates, etc. This particular denomination was worth five shillings which for a lot of its history was equivalent to one-quarter of a pound/sovereign. When decimalization came, the shilling was demonetized and 100 pence made up a pound. The twenty-five pence piece (one-quarter of a pound) is still referred to as a crown and is included here. The first crowns were of gold and struck under the name of a half-ryal (equivalent to 5 shillings and weighing 60 grains) in the first reign of Edward IV (1461-1470). No further coins of this denomination were struck until the reign of Henry VIII in about the year 1526. These were 22 carats fine and weighed 57 21/57 grains. His later crowns dropped in fineness to 22 or 20 carats and weighed only 48 grains. 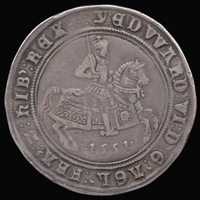 The first issue of Edward VI (1546 to 1553) was of similar weight and fineness. His subsequent issues were of restored fineness but the weight was further diminished. Elizabeth I (1558 to 1602) issued crowns which were initially valued at 3s 4d. Later in her reign (1592 onwards) they were once again valued at five shillings. The weight had stabilized at about 43 7/11 grains of 22 carat fine gold. The first silver crowns (which are mainly what is dealt with on this site) were struck by Edward VI in 1551. These are also the first English coins dated in numerals.